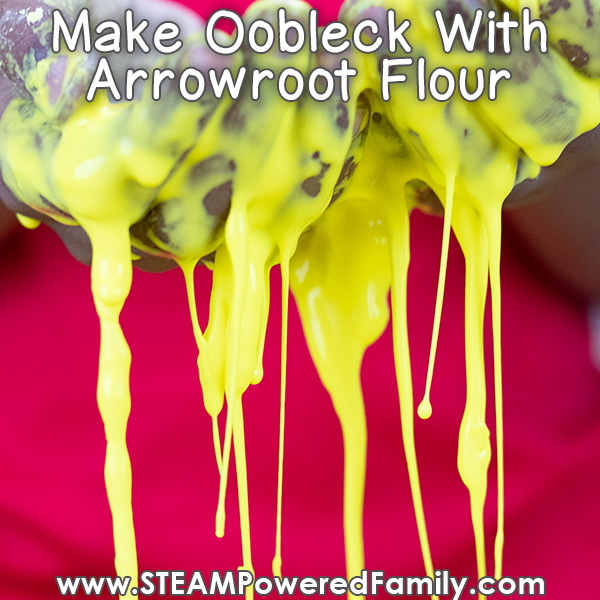 As much as I know about oobleck, I know very little about arrowroot. When the kids were little they used to eat arrowroot cookies, but beyond that I have no idea what purpose it serves. Well, until now! 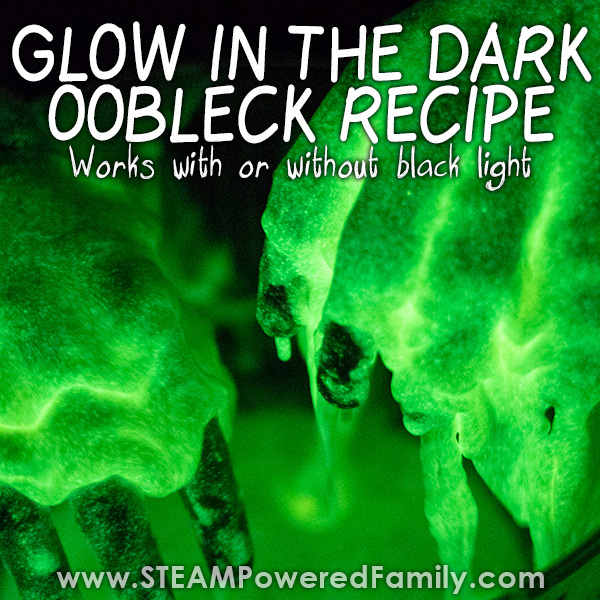 It makes a great ingredient for making oobleck without cornstarch! This activity is part of a series we did exploring how various ingredients worked in the creation of oobleck. We tested Cornstarch, Baby Powder, Tapioca Flour, Arrowroot Flour, Baking Soda and Potato. 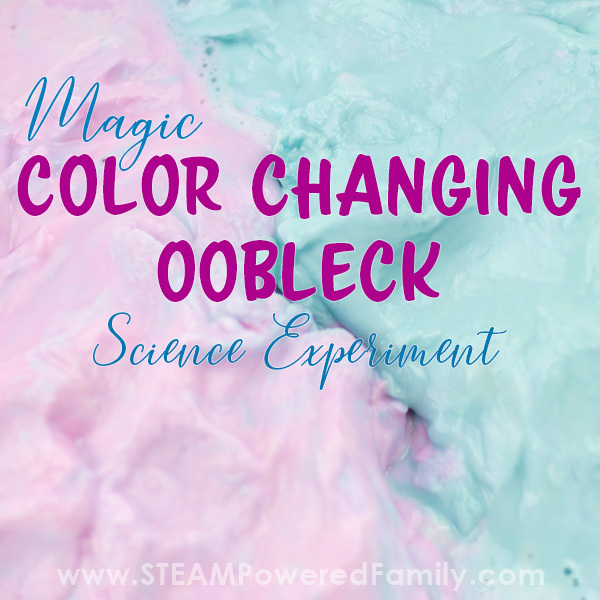 The results were surprising and created a fantastic Oobleck Science Fair Project. 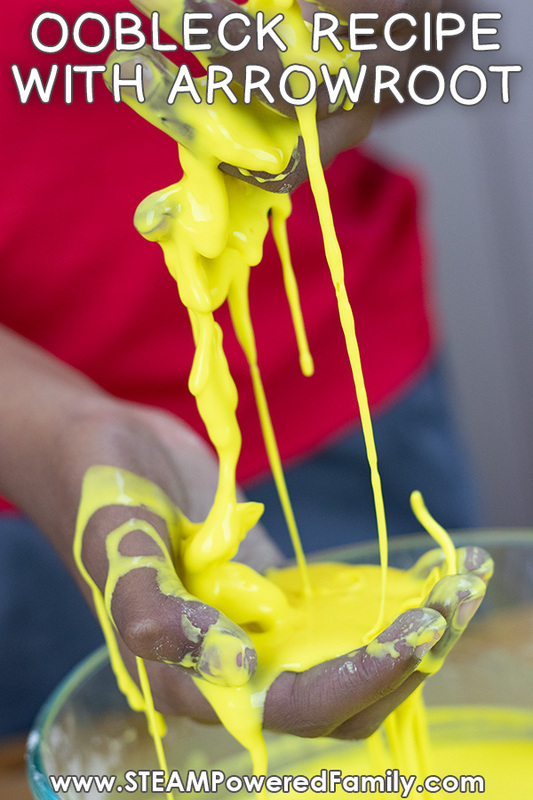 First up, if you are new to oobleck, it is also known as goop, magic mudd, goo or oobleck slime. It is a non-Newtonian Fluid that solidifies under pressure, and liquifies when pressure is removed. 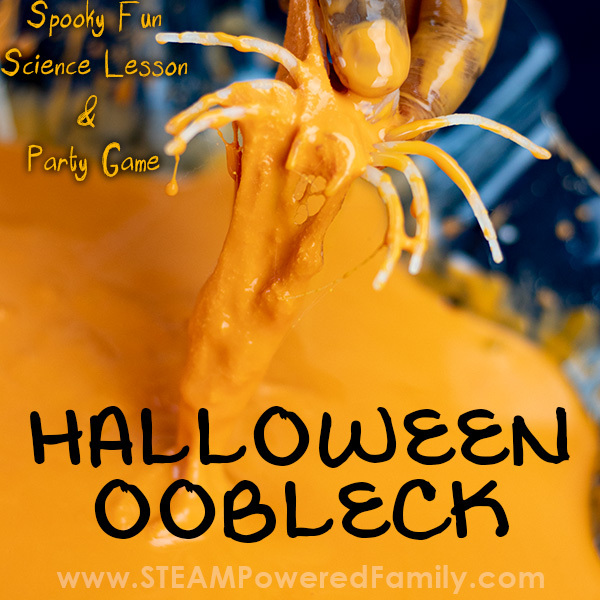 Oobleck is a fascinating substance that is very popular in science classrooms and science fairs. It is also great for sensory experiences and fine motor strengthening. 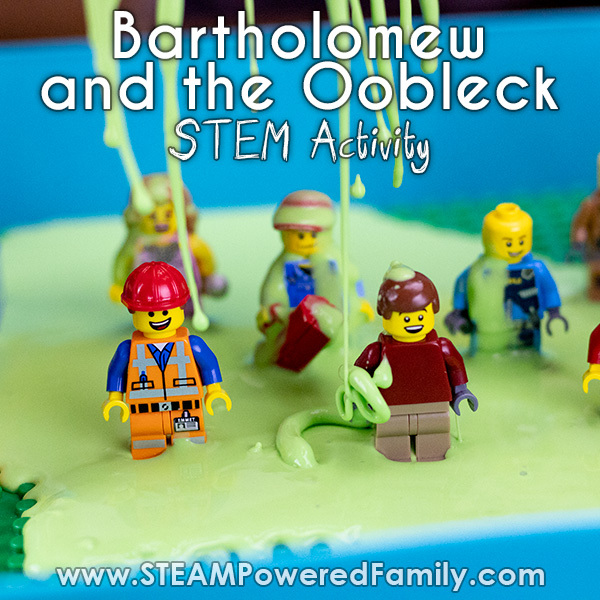 We have a LOT of information on this site about oobleck, so if you want to know more, check out the bottom of this article for lots of links to more information and fascinating oobleck science projects. So what exactly is Arrowroot? Arrowroot is a gluten free flour that is extracted from the root of a tropical plant known as Maranta arundinacea. This plant grows mostly in the Caribbean and South America in the rainforests. The largest commercial producer of arrowroot is St. Vincent and the Grenadines. What is important to know is that the terms Arrowroot Flour and Arrowroot Starch are used interchangeably. This was super important when we did our scientific investigation into ways we can make oobleck without cornstarch. You can find arrowroot flour in the gluten free baking area of the grocery store. 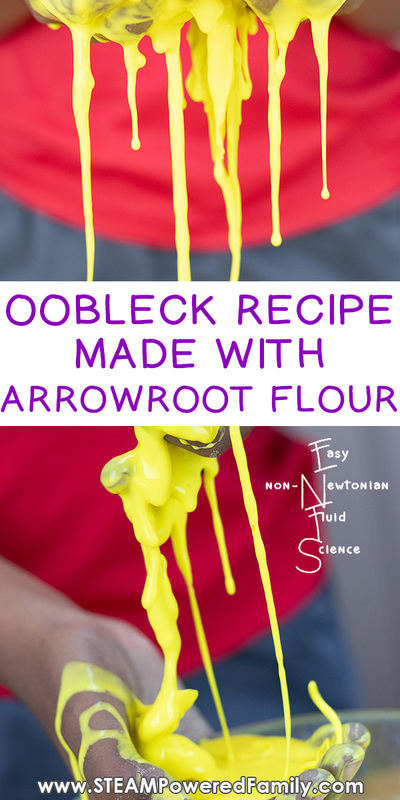 It took a little trial and error to get arrowroot to form into a non-Newtonian Fluid. It was HARD to mix at first, but then after mixing for a bit, it turned into liquid. 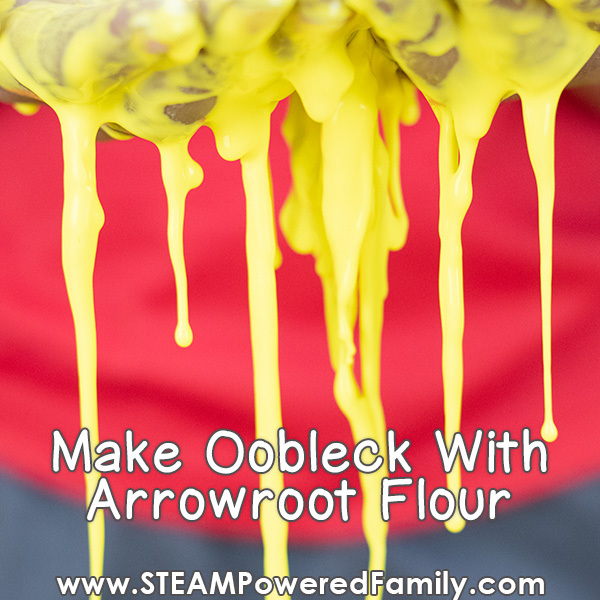 After some back and forth we found 2 1/4 cups of arrowroot flour and 2/3 cup of water gave us a nice non-Newtonian Fluid that was similar in consistency to our standard cornstarch oobleck. But remove that pressure and it liquefies and pours. While playing with our arrowroot oobleck we noticed some differences in the properties of our oobleck when compared to our regular cornstarch oobleck. First it is very clumpy. As I was mixing it with a spoon I noticed it didn’t flow and drip from the spoon normally, it clumps and pulls and breaks. After playing with it a bit more we discovered it gets very hard with very little pressure. This makes it easier to form shapes, since it seems even the pressure of it against itself seems to make it solidify. It still liquefies when you remove the pressure, but it forms lumps and waves as it pours. It is solidifying just from the pressure of itself. So cool! This different result in the properties of the oobleck by changing out the cornstarch for arrowroot starch (flour), was really fascinating. 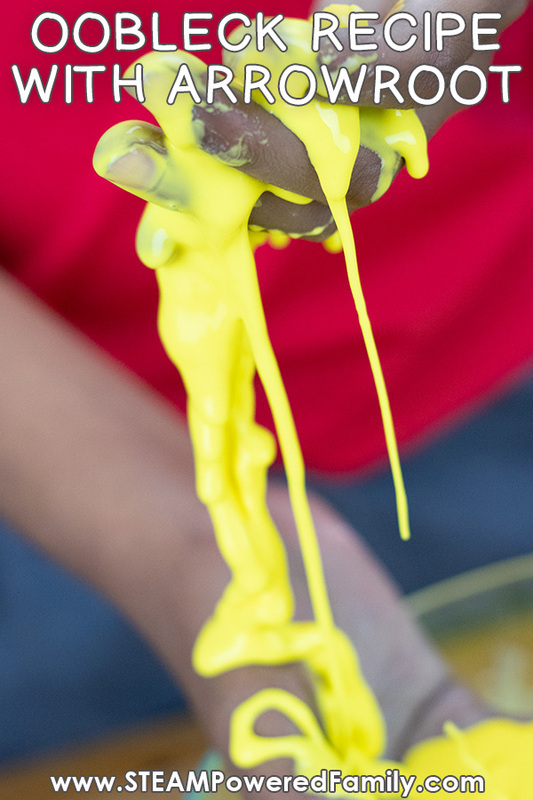 Just a reminder that Oobleck is a suspension, which means the molecules will separate form the liquid as it sits and fall to the bottom. You can just mix it up again before playing. As water evaporates from the solution it will dry out and eventually return to powder form. This is actually really good information to know to help with clean up! Simply let it dry out and sweep it up. If you want to save your oobleck for a bit, make sure it is kept in an airtight container. Or you can let it dry out and simply add water again the next time you want to use it. I will caution about saving anything that has been played with though, especially by multiple kids. 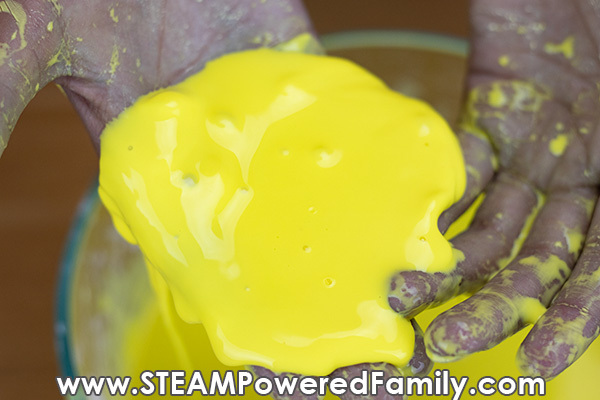 Just like with slime, kids hands are not usually the cleanest and all of that dirt and bacteria gets into the mixture. So use common sense. It is always best to make a fresh batch just as you are about to use it and play. When disposing of oobleck, scrape it into the garbage. Do not wash it all down the drain. You will end up with a big plumbing bill. The bits that do go down the drain, make sure they are flushed with lots of water. 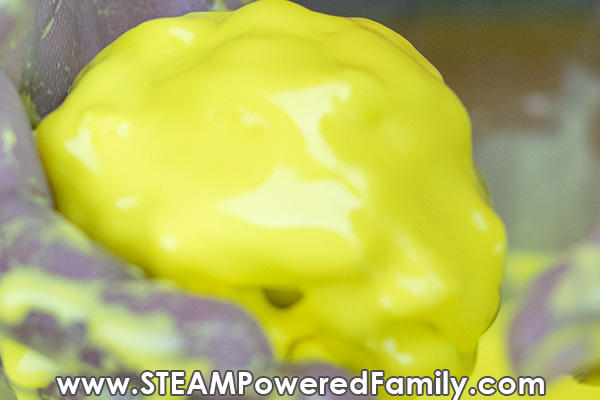 Remember, oobleck is non-toxic and taste safe. However I really don’t think it would taste very good!